Inception marked the end of our movie going life as we knew it. We were trying SO HARD to fit in one more movie 7 months ago before we had a baby but it didn't happen. That last week before Charlie arrived ended up full of trips to Target & Babies R Us & I worked almost up until the day Charlie was born. It's been 7 months since Charlie joined our family and while he's totally cramped our movie watching, we get smiles like this instead and it makes up for it times a million. At 7 months old Charlie is cuter than ever. 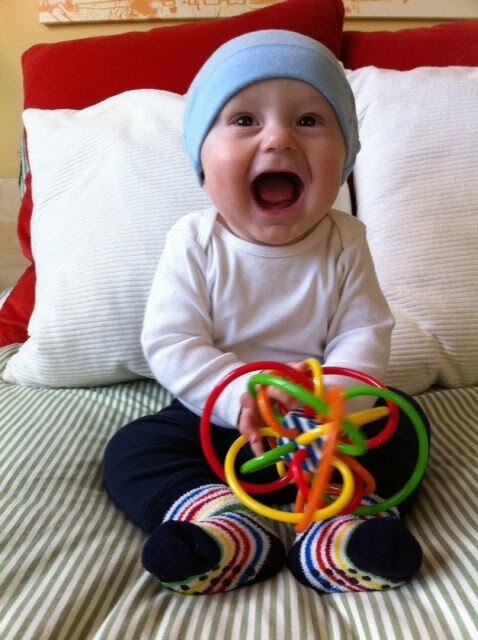 He smiles, laughs, squeals & gets excited at pretty much anything. At about the 6 month mark he started sleeping like a champ at night. We can put him down around 7pm and he'll wake up once in the middle of the night to eat then he goes back down 'til morning. He's been sick the past week though so the good sleeping has been a little spotty but I'm confident we'll be back on track soon. We've been working on feeding him "solids." I think it's funny that pureed baby food is called a solid. HE HATES FOOD. Like hates hates hates it. Over the past two months we've tried rice cereal, oatmeal, bananas, pears, avocado, carrots & sweet potatoes and it's not going well. We keep trying each day and we try and make it fun vs. stressful for him. 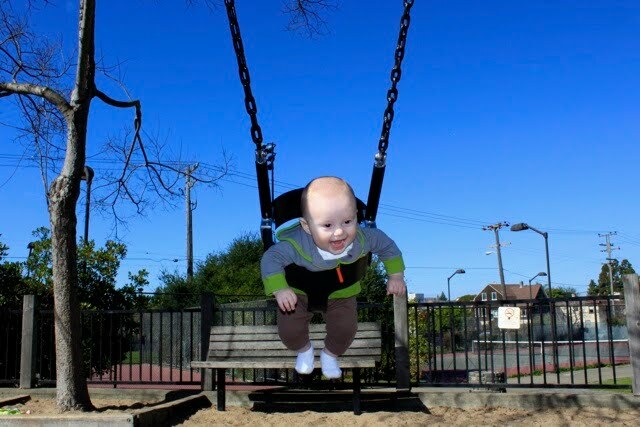 I'm sure he'll get the hang of things soon enough. For now he's happy drinking milk and I'm fine providing it so that works. Charlie started sitting up around Christmastime and has just started to lunge forward from the sitting position. The first few lunges forward resulted in him face planting on the rug but as of yesterday he seems to understand that if he puts his arms out, he can hold himself up and preserve those smashing good looks of his. If you lay him on his back he instantly rolls over onto his belly and gets in cobra position. He's starting to get frustrated that he can't crawl. If you put something just out of his reach he'll lay out flat and stretch his arms out in front of him as far as he can to try and grab it. When he can't, the whining begins. If you give him something to push his feet off, he'll scoot forward. It's super exciting to watch these changes happening but we're also very aware that the days of our little guy that we can plop down somewhere and he'll just sit there happily enjoying one spot are numbered. He's still pretty bald but we think his hair is going to be sandy blond. It's obvious he's inherited his mom's fair skin and he has his dad's dark dark brown eyes. It seems to work for him. He's friendly but is just now getting a little bit of stranger danger. No teeth yet but I'm predicting any day now. 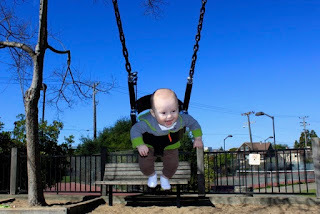 One of his new favorite activities is the swing! We love this kid so much. Side note, I also love Steve so much. There's a lotta love around these parts. I shall leave you all with this picture. 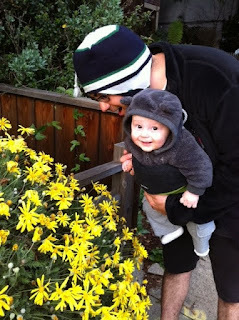 Steve, the plant biologist, teaching our son to love flowers too.